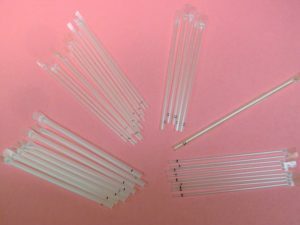 Custom and Medical Tubing | Medical Precision Plastics Inc. 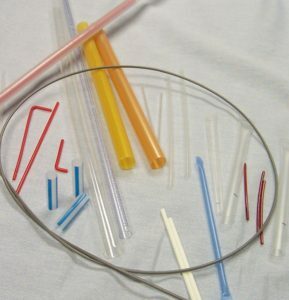 When you need thin-walled, small diameter plastic tubing for clinical, medical, or commercial use, look no further than Medical Precision Plastics Inc (MPP). 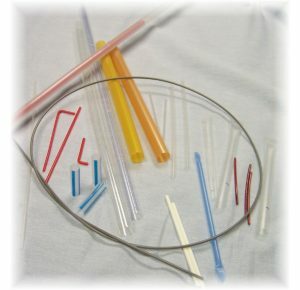 We offer a variety of flexible tubing products that can be used in countless medical and commercial applications. Our goal is to meet or exceed your expectations, so you can count on our customer service and quality. MPP has been providing customers, both domestic and international, with high-quality extruded products for over 25 years. With our extensive experience in the industry, you can depend on us to fulfill your order of medical or custom flexible and rigid tubing, with accuracy, reliability, and quality. We’re proud to display our motto — “Quality is Everyone’s Job” — to all of our customers. MPP believes in providing the best extruded plastic tubing products to every industry in need, including clinical, medical and commercial. Our economical Dropstirs™ single-use transfer pipettes are ideal for various medical diagnostic applications, such as urinalysis, hematology, and microbiology. A variety of sizes and lengths makes our single-use pipettes customizable for various medical applications. 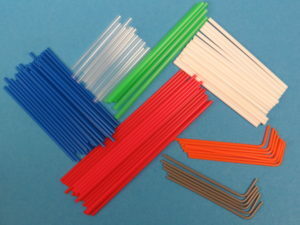 We have been manufacturing custom extruded, thin-walled tubing for the medical industry since our company was founded. We are happy to meet your commercial requirements as well. We currently manufacture various commercial tubing, for use in industrial markets, such as aerosol and lubricant spray cans. We can also provide co-extruded tubing, and many “value-added” services to meet your specific needs. Our commercial customers receive the same care, quality, and traceability as our medical accounts. For more information about our products’ commercial applications, or how our technical department can work with you to meet your specific tubing and packaging requirements, feel free to contact us. 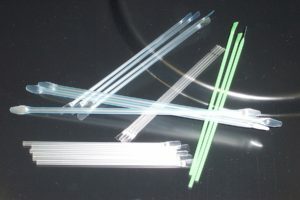 All of our extruded plastic tubing, whether for the commercial or medical market, including our Dropstirs™ single-use transfer pipettes, are made from various virgin polymer resins, such as polypropylene, polyethylene (LDPE & HDPE), polystyrene, and Pebax. We maintain two-way traceability of the materials and product and store samples for two years for product evaluation and testing. Various materials are always under evaluation to improve qualities such as clarity, gamma sterilization, and flexibility to make sure you’re getting the best. 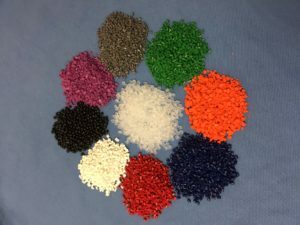 For detailed information on our custom, flexible, plastic tubing products, such as lengths, sizes, materials, and packaging, (and our capabilities), see the drop-down list below. 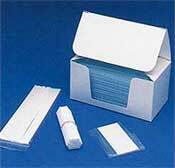 If you want to purchase transfer pipettes or other clinical test kit tubing, or if you’d like to place a custom tubing order, contact us today. Call us at 1 (215) 441-4800 or message us online. We look forward to working with you. Note: According to end-use requirements, pipette accuracy may vary. Users should undertake sufficient verification and testing to determine the suitability for their own particular purpose. MPP makes no warranty of fitness for a particular purpose. Printed Dropstirs™ are disposable plastic pipettes for repeatedly dispensing accurately measured volumes of liquid reagents and specimens. In response to demand from the Malaria/Dengue Fever market, MPP has developed reliable, low cost 5 µl and 10 µl Dropstirs™ for use in field test kits. Is a complete, easy-to-use, economical, unbreakable pipette system with built-in suction capacity. Has a flat sealed end which may be used for stirring. Replaces older systems which may have the potential to cross-contaminate individual tests. The ready-to-use, unbreakable Dropstirs™ help to eliminate the problems associated with glass tubes. MPP manufactures Dropstirs™ in stock and custom sizes to meet your specific needs. Unprinted Dropstirs: While the industry standards of 30 µl and 50 µl are often in stock, MPP will custom manufacture pipettes to deliver drop sizes from 10 µl to 60 µl. 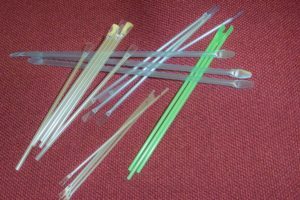 Unprinted Dropstirs™: The stock length is five inches, but Dropstirs™ are available in lengths from 3 ½ inches to 7 inches in ½ inch intervals. 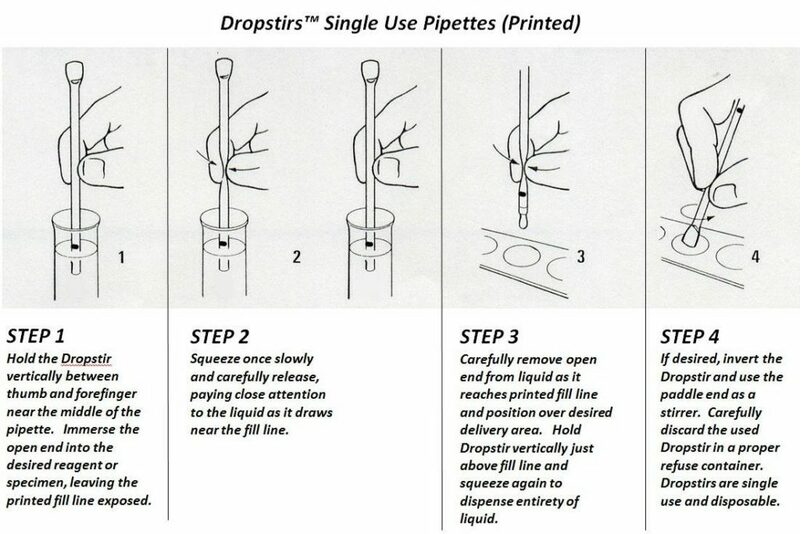 Printed Dropstirs™: The stock length is 4 inches but available from 3 1/2 to 5 inches in 1/2 inch intervals. Dropstirs™ are made from virgin polypropylene that meets FDA requirements. Full traceability is maintained on all lots of material and samples are kept for a period of 2 years. Other materials are always under evaluation to improve qualities like clarity, gamma sterilization, and flexibility. Since MPP manufactures all of its own products, we can provide the fastest turnaround in the industry. Once you are in our database (for stocked products up to 250,000 pieces) if the order is placed by 10 a.m., it will be shipped that day. Our facility now becomes an extension of your warehouse. This saves you time, space, resources, and money. 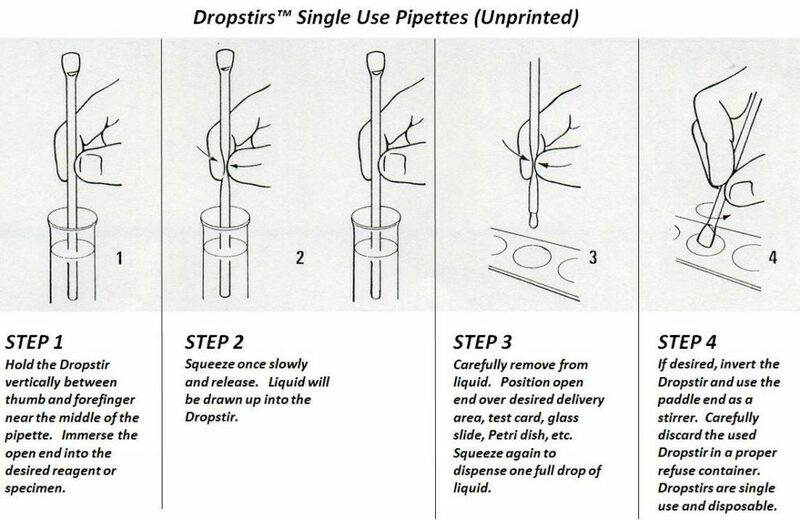 MPP will supply Dropstirs™ in bundles of 25, 50, 100, or any quantity you desire. Uniform quantities guarantee maximum efficiency in kit utilization. 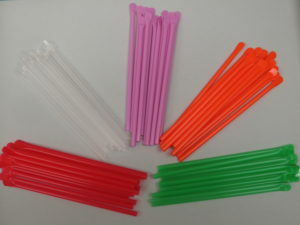 Dropstirs™ can be packaged in zip-lock poly bags, folding boxes, or bound with elastic bands. They are then packaged in poly-lined master shipping cartons. Standard master carton quantities are maintained to facilitate inventory management. MPP manufactures both printed and unprinted Dropstirs™ for diagnostic kit manufacturers who demand excellence and simplicity in their kit components. MPP supplies Dropstirs™in stock and custom sizes, and in colors to complement your kit or company's colors. Click on Image below, to view larger size. Utilizing the skills of our highly trained and experienced personnel we work with our customers to understand their needs. In close contact with engineering, quality and design technicians we are able to transform those needs into a customer-defined and approved specification that follows each job throughout the production process. 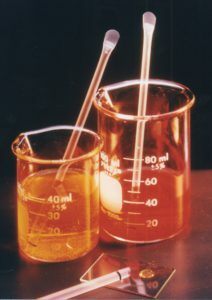 Samples of the desired product are provided before implementing a full production run. MPP has been providing, thin walled, small diameter tubing since 1977. Along the way, we have grown and expanded our capabilities. We have a long history with many of our customers, and continually strive to improve our manufacturing equipment and facility with new technology. We have earned our reputation as a world-class provider of close tolerance extruded tubing. While most of our experience has been with polypropylene, polyethylene (low and high density), propionate, polystyrene, acetate, and pebax, our engineers and production staff will work closely with our customers to develop the product that meets their needs. 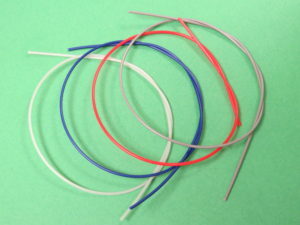 We also provide co-extruded tubing, and many value-added services. Working closely with a customer, we developed a method to provide coiled tubing without the traditional method of using a spool and winder. MPP developed a special packaging system that eliminates the problems of diameter fluctuations, kinks and tension caused by conventional winders. This is just one example of the creative thinking and adaptability we bring to each project. Extruded tubes can be cut to customer specifications for any of your application requirements and oriented in rows. Whether, cut to length, bent or coiled, our products are packaged to your requirements. Our unique packaging process eliminates the need for labor-intensive, in-house counting. At MPP whether your product is bagged, banded or boxed, it is an automated high speed one-step process. You receive precise, actual count to your specific packaging requirements every time. Exposure to dust and other contaminants is virtually eliminated. Our ‘no-nonsense’ approach is to deliver a quality product that precisely meets your needs – on-time, every time. We are known world-wide not only for our unsurpassed quality and rapid delivery, but also for our exceptional Customer Service. Our proficient and courteous personnel are quick to respond to every customer’s inquiries. At your request, they will research various shipping methods and costs. They strive to provide superior service and assistance to deliver your product in the timeliest and economical manner feasible. Contact our sales or engineering department with your requirements for custom extruded tubing. We welcome the challenge! !